For an advanced Android user, flashing is something they are bound to come across every now and then. Even more so, if you’re a regular visitor of one of the bigger Android modification and customization forums on the web, you’re more likely to have a knack for flashing different ROMs, tweaks, firmware and whatnot more than other users. Then, there are people who have an uncontrollable urge to try out every other ZIP file that they can get their hands on through recovery mode on their Android device, almost like an obsessive need to do so. Another group of Android fanatics that fall in this category are those who rely on nightly builds of any ROM – especially CyanogenMod – since they end up flashing a newer version almost every day. The problem with this excessive flashing is that, for one, you have to reboot into recovery multiple times, and second, you have to navigate through various folders to get to the file that you wish to flash. I, for one, have this habit of keeping my phone’s storage organized, and that ends up flashable ZIPs getting sorted in various folders, hence making the prior-discussed scenario a reality. On the other hand, if you continue to stow everything in the root of the SD card, you end up with a crowded space that’s not really ideal, and would still require you to carefully figure file names out in Recovery before you flash anything. That’s where Auto Flasher ROM Flash utility comes to the rescue. At it’s core, the app is a script that can pull together all the files that follow a certain naming convention, and then flash those ZIPs in a bunch. What this practically means for people who constantly switch from one ROM to another is that they can prefix all the files associated with a certain CM build with “cm_10_filename.zip”, and set the rule in Auto Flasher to flash all the ZIPs obeying this nomenclature in one go. This way, you can just apply whole packages without having to manually select each one of them – main ROM, kernel, PDA, radio, Gapps – all together. 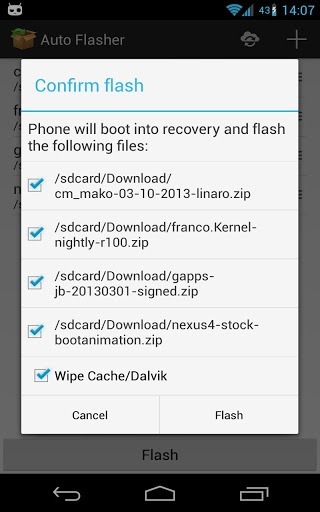 While certain recoveries allow you to batch install ZIP files, the advantage that Auto Flasher holds above all of them is that it doesn’t even require you to boot the device in recovery mode at all – everything works from within Android. The only limitation is that the app requires a rooted device (stating the obvious here), and would work only with TWRP recovery, which is a big let down for hundreds and thousands of users of ClockworkMod. Nevertheless, the app is highly useful for any obsessive flasher, and is available for free at Google Play Store.